If you are looking out for qualitative marketing data to implement your multi-channel marketing strategies across Brazil, Blue Mail Media’s Brazilian Business Executives List can help you as a strategic resource. With our database, you can easily connect with numerous key decision makers, C Level Executives, and professionals in various industries across Brazil. Blue Mail Media’s database aids you with complete access to marketing information to reach your target prospects via email, telephone, or mail and flawlessly execute your marketing campaigns. Blue Mail Media’s team of data scientists, experts and analysts collect data from authentic sources, verify data through telephone calls and emails, and update the same with newest details to maintain its accuracy. Since inception, we have helped many organizations precisely target their market to promote various products, solutions, and services. Also, we give you enough flexibility to get your list customized based on your business or campaign specific requirements. Our Brazilian B2B Executives List can be customized based on geography, industry, job titles, staff size, revenue, and a lot of other selects. Blue Mail Media is strongly positioned to help businesses in their expansion drive. Our well-established network of data partners enables us to help you without any geographical barrier. 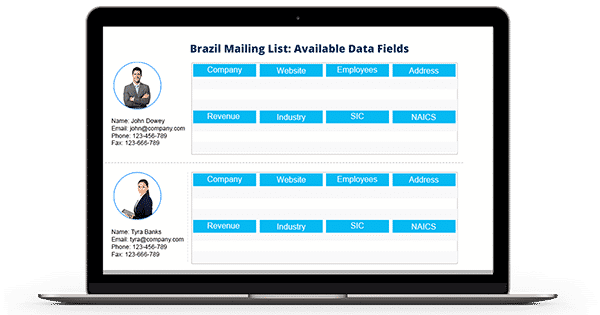 The Brazil Business Executives Mailing List that we provide can unlock seamless interactions between you and your target audience. At Blue Mail Media, we go an extra mile to ensure you realize a visible increase in your campaign response rate, conversion rate, and ROI.